Can you feel that? It’s summer. And it’s creeping just around the corner! Hooray! It won’t be long now until trips to the beach, evening bike rides and drippy ice cream cones become part of the daily routine. And frankly, I couldn’t be more excited. Summer is also all about eating the freshest fruits and vegetables you can get your hands on. I love seeing all the grocery stores and farmers markets bursting with colorful baskets of produce this time of year. Nothing inspires me more to get into my kitchen and create easy, healthy meals. Caprese salads are a staple around my house in the summertime. So I thought it would be fun to do a little twist on the traditional version by swapping out the tomatoes for fresh strawberries (although you can use tomatoes if you prefer), and adding in some peppery arugula as well. I then used this salad as a filling for some oven roasted portabella mushrooms. The hearty mushroom caps definitely turn this into more of a meal. Which makes these Strawberry Caprese Salad Stuffed Portabella Mushrooms a great choice for lunch or for a light summer dinner. I like to roast the portabella mushrooms on a baking rack so the juices drain away. This keeps them from getting soggy. And it helps them to maintain their shape after being cooked, which gives a really nice presentation to this dish. This recipe is easy enough to prepare for a quick meal at home, but it’s definitely company worthy as well! 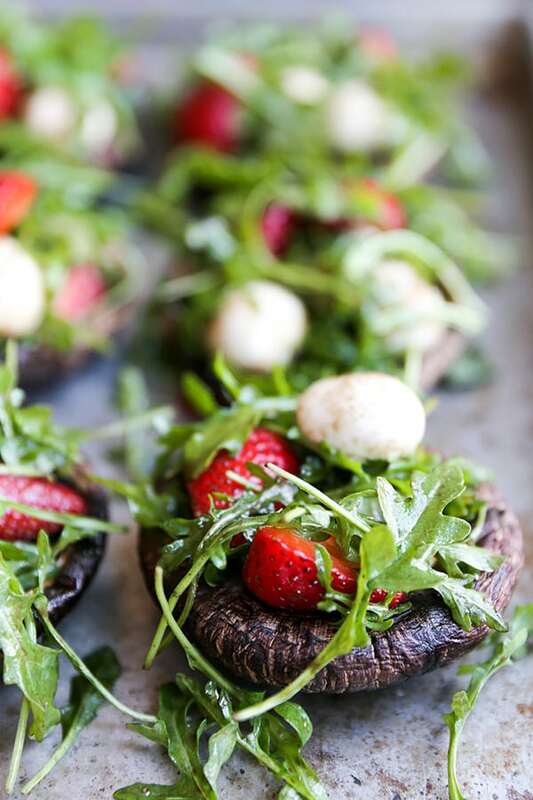 Roasted portabella mushrooms stuffed with fresh strawberries, mozzarella, basil and arugula are a healthy and quick summertime meal. Place a baking rack over a large rimmed baking sheet. 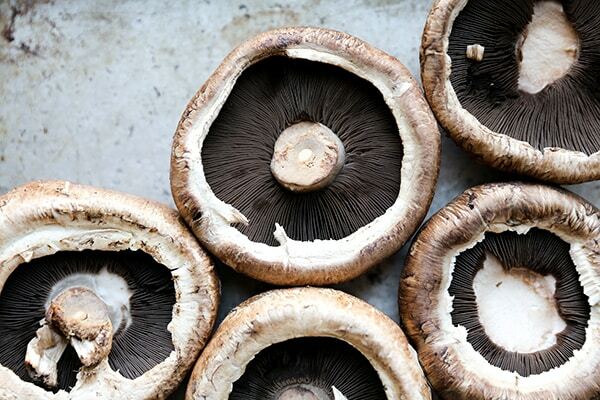 Clean the portobella mushroom caps by gently wiping them with a damp paper towel. Then remove and discard the stems. Place the mushroom caps gill side down on the baking rack. Set aside. In a small bowl, combine the olive oil, balsamic vinegar, salt and pepper. Brush some of the dressing over the surface of mushroom caps. Transfer the mushroom caps to the oven and bake for 15-18 minutes. The mushrooms should be soft, but still firm enough so that they hold their shape. Remove the mushrooms from the oven and set aside to cool slightly. Meanwhile, in a medium bowl gently toss together the arugula, strawberries or tomatoes, mozzarella and basil with the remaining dressing. Using a pair of tongs, flip the mushroom caps over. Fill each mushroom cap with some of the salad mixture. Serve immediately. These are just gorgeous Liz! PERFECT for summer dinner parties! Can’t wait! Thanks, Mary Ann! I know you’ll love them! This is genius! And it looks amazing! !